Q: What is "deodeok root" and "gugija"? Q: Why were all the passengers dancing in the aisle of the "Thank You Parents" tour bus near the end of the movie? Q: Why was Mother's employer angry with her at the start of the movie? Yoon Do-Joon has an intellectual disability. His friend is a bit of a trouble maker. His mother is always worried about him and protective to the extreme. A young girl is murdered and the lazy police of this small Korean town blame the obvious and helpless Yoon Do-Joon. The police interrogate him and make him sign a confession but Yoon Do-Joon is not really aware that he is signing his entry to prison. The mother, confident about her son's innocence will investigate the case and will go to any extent to free her son. 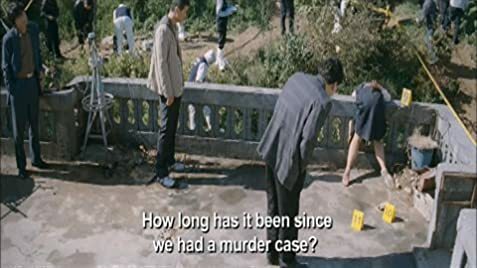 After the success of The Host (2006), Joon-ho Bong has crafted an intimate slow burning thriller with suspense elements that is contained in a small town, with small characters, but has a great scope. This movie is more similar to his first two movies, which I highly recommend. Hye-ja Kim is excellent as the mother. Her performance is understated but at the same time intense, cold and at the same time powerful. The cinematography is beautiful. The film moves along and builds slowly, more akin to the tempo of the small town we're visiting for the duration of the film, but the twists, turns, and suspense make it a highly rewarding and satisfying ride.